There is a faint trail that leads through the jack pines, through openings scented with the smell of sweet ferns mixed with wild blueberries, and cedar swamps dark and mysterious. At the end of this trail is the river; tea colored water stained from the tannic acid of water seeping from the cedar swamps and boggy places from which it is formed. On a slight rise overlooking the river are the remains of an old fishing camp; a remnant of a time that has been forgotten by all by a few old men whose memory stretches back to a simpler time. Whenever I would pass by this place I always stopped to ponder the men and their times. Nothing much remains of the fishing camp. A few rotting boards that once formed the platforms where A-wall tents were erected, and a crumbling stone fire pit where anglers would gather at the end of the day. Some crude wooden benches have long since succumbed to the passage of time, and the wooden outhouse has collapsed under the weight of winter snows and only a pile of rotting boards remains to mark its location. In a few short years nothing except the circle of stones of the fire pit will remain as a reminder of what existed here. I have no idea who used this place. It was abandoned long before I came to fish the river. Old timers in the area remember a group of men from the city that came here during the summers back in the 20's and 30's. They set up a camp here each summer, and for several weeks they would fish the river. In those days brook trout were the primary trout species, and much of the land was still recovering from the reign of the lumber barons that had stripped the land of its virgin white pines and cedars leaving only the inferior jack pines to reclaim the land. Some had tried to farm but the soil proved too poor, and the human population dwindled until only a few hardy souls remained in scattered cabins throughout the county. Today the land is nearly as wild as it had been when those unknown anglers spent their summers along the river. A faint, but still discernable path leads down the hill to the river. A small spring is near the path and a rusty tin cup still hangs on a wire wrapped around a rock. The bottom of the cup has rusted through, and the rust has stained the rock a dull red. I wonder about the men that drank from this cup, from the icy cold water that still emanates from the ground and nourishes a patch of tangy watercress. I imagine them coming up from the stream in canvas waders with wicker creels over their shoulders, and long bamboo rods with silk lines and gut leaders with several wet flies attached to droppers. 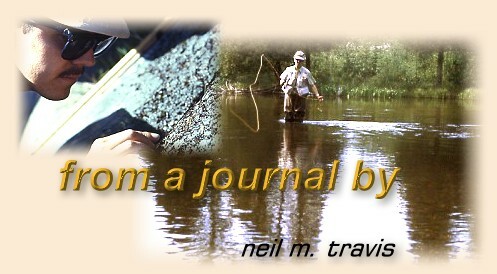 I can see them opening their creels lined with sweet ferns to reveal speckled brook trout glistening in the bottom. Who were these men and what had become of them? It is unlikely that any of them remain, or if they do they would be as fragile as the tin cup that hung by the spring. Do they ever think of this place or is it merely a dim memory that flits through the twilight dreams of some old man dozing in his chair? I find no answer here. The old fish camp reminds me of the brevity of life, the vanity of its boastfulness, the brashness of youth, and my own mortality. The brook trout are mostly gone from the river, and like the men who plied these waters with wet flies and silk gut they are only remembered by a dwindling few. The leaves of the quaking aspen flutter in a passing breeze too faint to detect, and I stand listening, trying to catch the sound of voices stilled by the rush of years, but only the faint fluttering of the aspen and the gurgling of the spring break the silence. What is the relevance of this place, and what lessons does it teach? I hurry away, uncomfortable with thoughts of my own relevance, the purpose of my life, and who will remember my passage through this place. The mark that I have made is less permanent than theirs, and perhaps that is as it should be. I step into the river, and look back up the hill toward the camp. From the river no visible sign exists that would hint that anything except the forest ever existed there. Time would ultimately erase all the signs, and only the rusty streak of the tin cup on the rock and a circle of stones would remain.